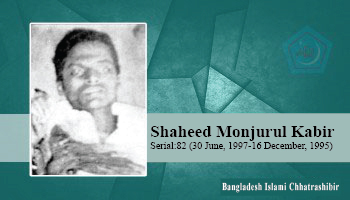 He was martyred alongside Shahid Shawkat Hossain Talukder at Bangladesh Agricultural University on December 16, 1995, by Chhatra Dal / Student Oikko (Student Front, Chhatra League) terrorists. He was a member of the organization. He dreamt that he would be martyred in Ramadan. So a few days before his martyrdom, he showed the place of the grave to his elder sisters and his relatives, where he is lying today.